← How To Retire At 55, My Dad retired last month! Earning $75,000 a year puts you about $20,000 ahead of the median U.S. household. The Wall Street Journal remarked in 2010 that the ideal income for happiness is $75,000 a year. At $75,000 a year in most areas of the country you can afford a decent lifestyle and still save a good amount of money. Mrs. C and I first hit a $75,000 income in 2015 and reaching this level has allowed us to save and invest far more than we ever though possible. If you are struggling on a $75,000 budget read ahead to see what opportunities you may have to change your budget and save more money. Here is a breakdown of How Mrs. C and I got ahead while earning $75,000 a year. House Payment: We bought our house with a 20% down payment for $145,000. It’s a 5 bedroom 2 bath house on 3 Acres. We recently paid cash to expand our acreage to 11 Acres by purchasing the railroad bed behind our house. Our mortgage is $570 per month. The most important aspect of our housing situation is that as our income has increased we have not moved to a bigger, more expensive house. Avoiding lifestyle inflation in your highest cost item is perhaps the best way to build wealth. Groceries: We eat out only about once a month. We shop sales and stock up on items when they are on a good sale. Every two weeks we spend about $300 on a big grocery trip and on the odd weeks pick up fresh fruits, vegetables, and bread. This trip is usually around $50, putting our monthly total around $700. Payroll Taxes: Payroll taxes make a large part of our list. There is not much we can do to reduce payroll taxes. Ideally at some point Mrs. C. or I will work for an employer that offers an HSA. When you contribute to an HSA account through your employer the contributions are exempt from payroll taxes. When you contribute to one on your own only federal income and state income taxes are deductible. Property Taxes: Property taxes for our house are around 1% of the value of the property. This is another aspect of avoiding lifestyle inflation. As your home increases in value your property tax bill increases. Make sure to challenge your property tax assessment if it is out of line with the actual value of your house. Property and Car Insurance: We have our property and car insurance with the same carrier and have a high deductible ($2,500). We pay it all at once, which gives us a decent discount as well. A big savings on car insurance is having state minimum coverage because we have no car payments and drive low cost vehicles. Gasoline: This varies throughout the year, but $200 per month is about right. At $3 per gallon this works out to 33 gallons per vehicle per month. We drive a 2000 Toyota Corolla worth around $700 that gets 30 MPG and a 2007 Honda Odyssey worth around $7,000 that gets 20 MPG. Health Insurance: Mrs. C. and I have a silver plan through the Obamacare exchange. The children are covered by the federal CHIP program, which costs $10 per month for insurance for kids. To qualify for CHIP, AGI needs to be between 133% and 212% of the Federal Poverty Level. Premiums in the Obamacare exchange are based on adjusted gross income, so contributing a large amount to tax advantaged accounts reduces health insurance costs. By keeping our AGI under 200% we also lower the costs of our health insurance through the health care exchange. Vacation: Last year on our family vacation we went to visit family in Ohio and Kentucky. As part of this vacation we visited some fun attractions like Dinosaur World and The Corvette Museum. We do several small day trips to somewhat local attractions like Binder Park Zoo in Battle Creek and The Museum of Science and Industry in Chicago. These smaller trips are usually funded out of the Misc. budget item. Vehicle Payments: We pay cash for vehicles and pay for maintenance out of the Misc. heading in our budget. In 2016 we had to replace Mrs. C’s 2004 Honda Odyssey and thanks to maintaining an emergency fund we were able to pay cash and upgrade to a 2007 Odyssey. Child Care: We have always made our schedules work with child care to avoid needing daycare. I work mostly seasonally and Mrs. C. is able to adjust her work schedule around when I am working. When I travel for work she works only while the kids are in school. We have never paid for daycare. Years ago before I started working in this industry and we were earning closer to $30,000 a year Mrs. C. worked during the week and I worked double shifts on Friday, Saturday, and Sunday. Clothing: We save a ton on kid clothing through handing clothes down through the kids. We keep totes for each clothing size and rotate out totes as the kids sizes change. There are some clothes that have gone through all four boys. In an average year we spend about $200 per person on new clothes. Federal Income Tax: Contributing $20,000 to tax deferred accounts almost eliminates a tax liability at this income level. The retirement savers tax credit subtracts another $400 of taxes and the child tax credit is now $2,000 per kid with up to $1,400 refundable per kid. We minimize our federal income taxes by planning out our taxes using my tax planning spreadsheet. We use this to compare situations side by side, so we can get the most bang for our buck by maximizing our available credits and deductions. Mostly thanks to the expansion of the child tax credit, a family with 4 kids earning $75,000 and contributing $20,000 to tax deferred accounts will get a federal refund of over $5,000. Student Loans: Mrs. C. didn’t go to college, and my Bachelor’s degree was paid for by my parents. I went to community college for the first two years, and earned a small scholarship. I also took CLEP exams to keep the costs down. The total cost after tax credits, scholarships, and CLEP exam savings was around $20,000. I had no housing costs in college which was a huge savings. I also worked the entire time, which greatly lowered the opportunity cost of going to college. Investment Expenses: While this doesn’t show up on our budget, it is a somewhat hidden cost in all budgets, since it is taken out of our savings and not directly out of our income. All mutual funds charge some short of fee in order to manage the fund. Actively managed funds can easily charge over 2%. On a $100,000 investment portfolio this is over $2,000! I use Vanguard index funds in my IRA accounts and recently opened up a Betterment taxable account which uses Vanguard ETFs. Both methods avoid transaction fees and the fees for the mutual funds range from .09% to .18%. Betterment has a fee for their service ranging from .15% to .35%. By using Vanguard and Betterment I save thousands of dollars per year in investment fees, allowing our money to grow faster. Life Insurance: I have a $500,000 20 year term policy that costs $20 per month. Mrs. C has a $250,000 10 year policy that costs $10 per month. Her cost is essentially 4X as high because she had been a smoker in the past. Still, we get an incredible value and a lot of piece of mind from this cost of only $30 per month. Life insurance is extremely important for anyone who has kids or other dependent family member. Haven Life has a great tool for estimating your life insurance costs. While earning $75,000 a year this budget shows that it is possible for a family of 6 to save $36,000 per year, hitting a 48% savings rate, including the positive $5,000 net tax return the family will receive in the following year. At this rate the home would be completely paid off within 6 years of taking out the mortgage. Once the house is paid off the family would have an additional $7,000 to build wealth with, allowing them to invest $42,000 every single year, hitting a savings rate of 56% on a $75,000 budget. 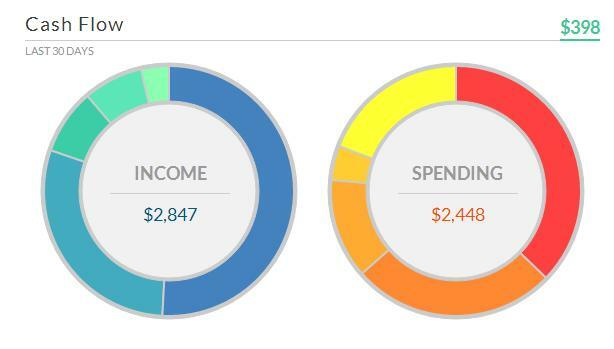 Personal Capital also gives a great net worth snapshot, which includes ALL of our investment, credit, and bank accounts. Personal Capital talks directly to all your bank and investment accounts and you can input your holdings that are not trackable through online accounts, such as real estate, vehicles, and precious metals. Most importantly, Personal Capital is free. If I only had 1 bank account and 1 investment account, I might not need it, but with several accounts Personal Capital is extremely useful. Where Could This $75,000 Budget Be Cut? Sure a 48% rate is great and all, but it could be better. If we were willing to give up a bit more lifestyle I bet a family earning $75,000 a year could hit a 60% savings rate. One of the problems we all have is that we tend to view things as being necessary, that absolutely aren’t. One of my favorite books for putting these imaginary needs in perspective is The Minimalist Budget: A Practical Guide On How To Save Money, Spend Less And Live More With A Minimalist Lifestyle . I think all American’s could use a little bit more of a minimalist philosophy to help with determining the true difference between needs and wants. 1. Housing: We moved up in housing about 4 years before we started earning around $75,000 a year. Our previous home was in a safe neighborhood and large enough for our family. The main downside was a small yard of only a quarter acre. Had we stayed in this home our house payment would be $330 a month on a 10 year mortgage. This would be saving us $240 a month on the house payment, $60 a month on property taxes, and $200 a month on extra principal. The house would also be paid off 5 years earlier. Saving that extra $300 on the payment gives us $3,600 more savings a year. Our current home cost $145,000 in southwest Michigan and our previous home cost around $50,000. This would bring total yearly savings to $39,600. 2. Cut Cell Phones and Comcast: Believe it or not cell phones and cable TV are completely optional expenses. Cutting these expense down to a couple prepaid phones and dial up internet (Yikes!) 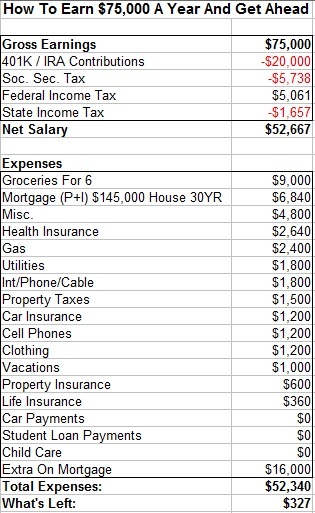 would drop these expenses from $250 a month to $50 a month. This is another $2,400 a year, bringing the total savings to $42,000. 3. Vacations: Vacations are also optional. We can take the kids to free parks and to the beach. Throw this $1,000 to savings and we hit $43,000 of savings on our $75,000 budget. 4. Groceries: We buy some junk food and don’t plan meals well. We could cut this $9,000 to $7,000 and still eat well. This brings the total savings up to $45,000. $45,000 of savings per year with a $75,000 budget equals a savings rate of 60%! Saving $45,000 and earning an average rate of return of 7%, it will only take this family 14 years to become millionaires, and that’s starting from a $0 net worth! 5. The next option is to focus on increasing income. For a two earner household earning $75,000 per year equates to 2 people working full time earning $18.75 per hour. Working 10 more hours per week, even if it is at a straight time rate will increase your income by 25% and spending a couple hours each week to look for a second job or a better paying job can be extremely rewarding. a 25% total increase in income over this $75,000 budget would bring gross income to $93,750. Under 15% should go to taxes if the family is properly optimizing their tax situation. Increasing their income from $75,000 to $93,750 would then increase total yearly savings by $18,750! What are your thoughts on this $75,000 a year budget? If this seems implausible to you, check out Dave Ramsey’s Total Money Makeover Book as a starting point to taking control of your money. 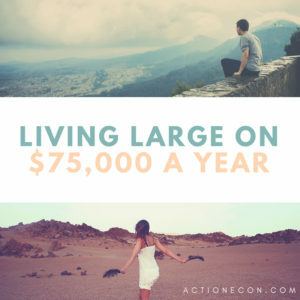 7 Responses to "Living Large on $75,000 A Year: Build Long Term Wealth With A Middle Class Income"
Greetings John- fascinating article that is a blueprint for being successful with budgets and investments. It should be a must read for HS and college students, along with an assignment to analyze and personally evaluate their financial assumptions and future goals. There is one area in your plan that causes me pause however, and that is your level of liability on your auto insurance. While “state minimums” are certainly going to be the least expensive, after having personally been “at fault” for an accident, you’ll want the most liability insurance possible if that need comes. If you have insufficient liability protection, then you’ll be on the hook to pay the difference or potentially could lead to personal bankruptcy. That could erase your years of hard work. I enjoy your blog, keep up the great article and take care. Hi Mike, thanks for the comment. long term I want to work on increasing my liability protection, I think that is an overall good move. I live in Michigan which has a “no fault” insurance program. I need to take a deeper look into the details, but overall our premiums are higher than most states because of this, but that excess liability issue is removed. Inspirational post. What’s great about the savings rate metric is that it applies to everyone across all income levels. 48% is very good. I’ve no doubt that you’ll accomplish your goals in 14 years. Also, this post is a good reminder that things like cell phones/cable/Netflix and their related costs are optional. I’m new here, and found this blog entry searching for a budget breakdown for a family of 4. The cost of living is much higher in our state. We pay 3x what you pay for our first home, 1800sq’ on 1/2 acre, where we have lived for nearly 7 years. Can you provide any advice or direction for those at this income level in more expensive areas? Sure. Your biggest 3 costs are for most people housing, vehicles, and taxes. People in general (myself included) are resistant to moving their location, however that is the number one way to reduce your costs. Some people who work in larger cities will trade having an hour commute for less expensive cost of living. Another option is to change jobs and move to a lower cost of living area. Even from a local standpoint, you can move to a lower quality home. In our county the median home is over $150,000, but our first home was just under $50,000. For people who aren’t willing or able to move out of these high cost of living areas the biggest bang for your buck is getting a room mate. This works especially well in high cost of living areas like NYC and Silicon Valley. You can typically rent out a single room in your home for half your housing cost. That’s a big deal. Saving on vehicle costs: don’t have your ego wrapped up in your car. You don’t need a $30,000 car. The average car payment in America is $500 a month. A $3,000 car does 99% of what a $30,000 car does. I’m still driving my $1,200 car I bought 5 years ago. Saving on taxes: If you substantially reduce your housing and vehicle costs it is really easy to contribute more to tax advantaged savings accounts and reduce your tax bill. For someone who was paying $1,500 a month in housing and $500 a month for a car payment, getting a room mate paying $750 a month and getting rid of the nice car would increase cash flow by $15,000 per year. Contributing that to retirement accounts in the 25% federal bracket and a 5% state bracket would save you another $4,350 a year on taxes. Thank you for your time and thoughts replying. We don’t drive fancy cars. I have a Ford and my spouse has a Civic. A roommate is out of the question as we have two young children, pets, and all the mess and disruption to go with that (since you’re a parent, you know this). Not to mention nowhere to put a roommate. We have very specific, secure jobs and are both tenured, mid-career professionals. It’s not possible to just up and move to another area and incur those expenses, let alone downsize locally because our home is builder-grade as it is and the market is aging and very limited. When we bought our home, anything below a certain price point came with more problems than we had money or time for as full time working parents. We bought in a farther away, lower cost area just to get into a clean, functioning, livable home. So can you break this down a little more? I completely understand not wanting a roommate with kids. We’ve had roommates before and our kids have shared rooms during this time. It certainly wasn’t always pleasant to say the least. Fords and Hondas can come with several hundred dollar car payments as well. I like the guideline that Sam at Financial Samurai has for cars, suggesting to have total value of all vehicles at <10% of your yearly income. This is pretty extreme, so even moving up to 20% of yearly income is on the right track. I've worked with some guys who have trucks that are more than 100% of their yearly income, craziness! 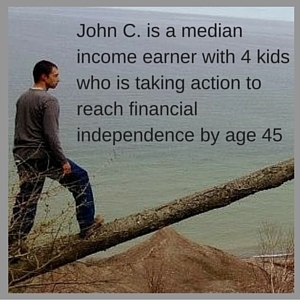 If you are unable to make adjustments to the big 3, housing, cars, and taxes, then you won't be able to make as much traction and your biggest ability to move the needle in your finances is by earning more money, whether that is working extra hours at your current job or one or both of you getting a nights/weekend gig in addition to your normal job. I would look into grocery shopping at a discount chain such as Save-a-lot or Aldis and doing extensive meal planning to save on grocery costs which is usually the largest expense after the big 3. Having a written budget and going over each line item every month is a major way to find some hidden money as well.